Favorite photographer to work with: This is definitely a tie between Foxy Pinups and Vixen Pin-Up Photography. Both photographers are amazing, and I just love that they bring out the unique inner beauty in every person that they work with! Artist/Photographer/location of featured photo(s) Tell me about your featured photo(s). When were they taken? Why are they your favorite? Tiki Style. I love this photo because I am wearing hot pink and orchids! I love pink and orchids are my favorite flower...win, win! Showgirl style. I have dreams of being a Vegas show girl...this shoot made my dreams a reality! Sailor style. 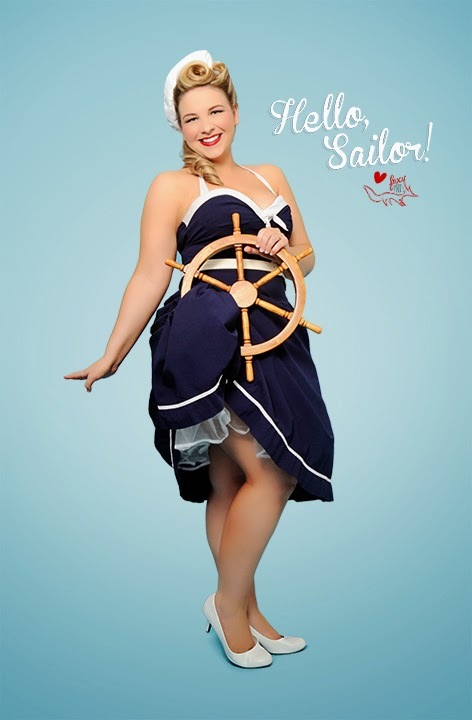 I love sailor styling, I had such a great time doing this shoot and I loved being a ditsy sailor girl! How long have you been modeling/enjoying photography? I have been modeling since I was a little girl, I used to be really into the pageant scene and contemporary fashion modeling. That was until I did my first pin-up session in 2011 and I was completely hooked! Who are your favorite Pinup Models? Past or present inspiration? Past inspirations are definitely Marilyn Monroe, Betty Grable & Veronica Lake. I am also a huge fan of Bianca Bombshell and Katty DeLux. Pin-up is so amazing because it embraces so many styles and all body types, I am inspired by everyone in the community. I have battled my whole life with body image issues and I just love seeing ladies of all walks of life flaunting what god gave 'em! What is some of your favorite clothing lines? Favorite Designers? Favorite designer brand is definitely Burberry! I am pretty sure that Tatyana and Pinup Couture CANNOT make a bad dress. I also absolutely love Rago Shapewear and Secrets in Lace! If you could shoot with any photographer, past or present, who would it be? 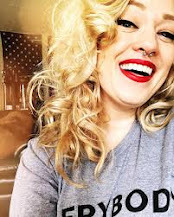 I am totally old school, and would love to work with a pin-up artist. Of course Gil Elvgren if I could time travel, but Olivia De Berardinis would be pretty amazing too! What is your favorite color and why? Pink, all shades. I love wearing pink and surrounding myself with it, it just makes me feel happy and reminds me of flowers and springtime! If you could have dinner with anyone, living or dead who would it be? Definitely my grandmother. She passed away 6 years ago, but she lived through the depression and all the "good old days"...it is always amazing to talk to someone who has been alive for almost a century. There are just so many things that we can learn from those who came before us! Maybe we could time travel and get a whole bunch of vintage sewing patterns and fabric! How did you get your model name? My middle name is Joan and of course I love Christina Hendricks' character in Mad Men! Manhattan because, I feel it evokes a fun big city vibe, and I would love to spend some time in New York City! Also, I LOVE geeky stuff and am a huge Watchmen graphic novel and Dr. Manhattan fan.